Lets Work Together To Keep The Live Rock Music Scene Alive! The Eagles where our support on 1 outdoor gig and it was a storm at the other outdoor gig !! Sorry for the time delay!! Jam night @ The Wishing Well Heywood - Last Thursday!! Function band side project anyone? Well I'm genuinely glad I didnt have a gig tonight. STOLEN! Please call if you see this bass! 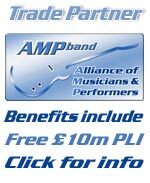 Get £5000 to upgrade your pub for live music! Saturday 28th We need a band! !